back to the garden... flower power comes full circle: Two Sold out shows at the Seattle Film Fest! Two Sold out shows at the Seattle Film Fest! Opening night of the world premiere of "Back to the Garden, flower power comes full circle" at the Pacific Place Cinemas. 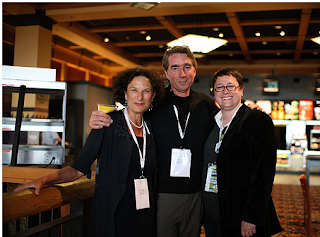 from left to right, Judy Kaplan: producer, Kevin Tomlinson: Director, and Beth Barrett, Director of SIFF Programming.